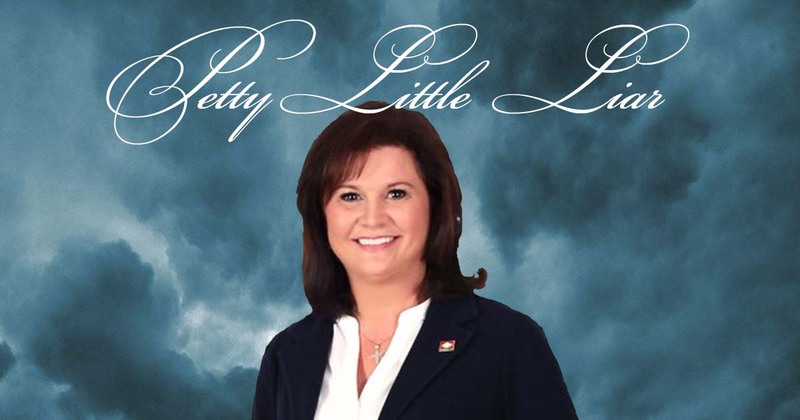 As mentioned a few months back, Rep. Laurie Rushing (R-Hot Springs(?)) was sued in North Carolina for defamation based on Rushing’s knowingly false statements that her former son-in-law killed her daughter. What wasn’t mentioned in that post, because it wasn’t known at the time, was the Laurie Rushing is apparently the kind of person who will go out of her way to avoid addressing anything, including a lawsuit. More importantly, perhaps, she’s the type of person who will lie about the most basic things, from relationship status to where she resides (both in general and at any given moment), whenever it suits her desire to get re-elected. Let’s start with a really basic question, however, since that will play into the entirety of this post: Where does Laurie Rushing live? If you look at Laurie Rushing’s CC&E2 reports, you’ll see her list an address of 134 Cannon Ridge Pt. in Hot Springs. Except, around the time her divorce was being finalized, Rushing and her ex-husband sold that house to Rushing’s mother in November 2017, and her mother sold it to a third party in December 2017. More importantly, perhaps, Rushing’s May 2017 complaint for divorce says that she and her ex-husband separated on or about January 1, 2017, and that they have “lived separately and without cohabitation” since that date. The summons that was issued for her ex-husband in that case specifies that he lived at 134 Cannon Ridge Pt. as of May 2017. By definition, then, unless she was lying to the Circuit Court, she has not lived at 134 Cannon Ridge Pt. since January 1, 2017. So…she’s filing CC&E reports with an incorrect address? It would seem so. After all, she lists 307 Dellmere Dr. in Hot Springs as her address for campaign purposes, and that address is reflected on her General Assembly website. That house belongs to Rushing’s mother, Lorna Nobles. But here’s the first weird wrinkle: the complaint and summons for the defamation lawsuit were sent to Rushing at that address, restricted delivery, return receipt requested…and it came back as undeliverable. A second copy of the complaint and summons were mailed to 1301 Capitol Ave., Apt. H, in Little Rock, which she listed as her address when she contacted the Garland County Sheriff’s Office in December 2016, just before she and her then-husband separated. That also came back as undeliverable. More weirdness: On October 27, 2017, in a deposition for purposes of finalizing her divorce, Rushing testified under oath that her address was 134 Cannon Ridge Pt. (despite, again, saying in her original complaint for divorce 5.5 months earlier that she did not live there). Yet, the divorce decree, entered on November 2, 2017, again says that the parties separated on January 1, 2017, and have lived apart since that date. The Qualified Domestic Relations Order entered in May 2018 lists her mailing address as 337 Dellmere Dr., which is likely a typo for 307. January 1, 2017, as a separation date for Rushing and her ex-husband has extra significance. That’s also the effective date of her lease of apartment #507 in the Capitol Hill Apartments building adjacent to the Capitol. Nevertheless, her SFI, which was handwritten and not some autofilled form, was filed on January 31, 2018, and listed 134 Cannon Ridge Pt. as her address. So, again, where does Laurie Rushing live? 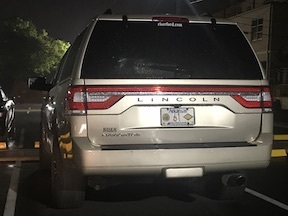 In an effort to get the complaint and summons served on Rushing, we gave a process server her Capitol Hill Apartments #507 address in Little Rock along with a picture of her vehicle. On October 11, after getting her cell phone number, the process server made contact with Rushing and let her know that he was trying to deliver legal documents to her. She told the server that she was out of town “until next week.” On October 15 (i.e., “next week”), the process server again called Rushing. She did not answer, but she texted that she was out of town until the following week. I note that Rushing’s car was in the lot of the apartment building during both of those weeks that she was allegedly out of town, though not the entire time, which sure makes it look like she was in town and using the car, but whatever. 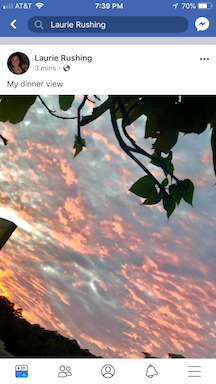 I saw the post about 15 minutes after she put it up, and I immediately recognized the building in the photo as the Riviera Condominiums building in Riverdale, not far from my house. 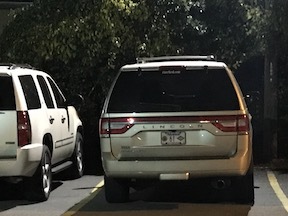 So my girlfriend and I hopped in the car and hurried down there to hopefully serve Rushing.4 Once at the bottom of Cantrell Hill, it did not take much time to figure out that the picture had been taken from the patio at Pizza Cafe, and we found her car behind the restaurant. The video is a poor angle at first — we had to quickly pull into a spot before Rushing reached her own vehicle — but what you can’t see at the beginning is Jess saying “Hey, Laurie!” and Rushing momentarily smiling until Jess continued and mentioned that she had legal papers for Rushing from North Carolina. At that point, you can see Rushing come into frame and scurry to her vehicle, refusing to accept the documents or to even look up. She goes first to the passenger side, then (I assume) realized that she had the keys, so she goes around to the driver’s side as Henderson wanders about like a dolt. Henderson momentarily acts like he’s going to somehow interfere with the process, then quickly aborts that plan after he realizes they are being recorded. Finally, as Rushing starts to pull away, Jess puts the summons and complaint under Rushing’s driver’s side windshield wiper as Rushing backs out, and the papers remain on the vehicle as Rushing pulls away. I have to admit, I find the video hilarious, and not just because of the Sonny & Cher dubbed over it. There is just something karmically funny to me about repeatedly lying to avoid service of process, then getting served anyway because you just couldn’t keep yourself from posting a picture of a building less than two miles from where the person who wants you served lives. She later deleted that post, but not before multiple people got screenshots and sent them to me, asking if I knew what it was about. Pandora’s Box is a good choice of words here, though not in the context that she used them. If we go with the basic definition of the phrase — “a process that generates many complicated problems as the result of unwise interference in something” — the real Pandora’s Box in this whole mess is where Rushing actually lives. By constantly avoiding service, Rushing caused us to look more deeply into the various multiple addresses, including incorrect addresses on her CC&E reports and statement of financial interest, that she has given over the past year or two. 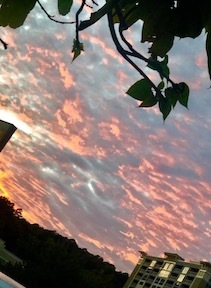 At the end of the day, I can’t say with any certainty that Rushing lives in Hot Springs at all. 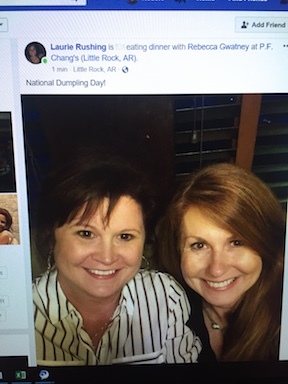 More likely, it appears that she is claiming her mother’s Hot Springs address as her mailing address so that she can run for reelection while actually living in Little Rock. The only “proof” that she lives at 307 Dellmere Dr. is Rushing’s own statement to that effect, and, as we have seen here, Rushing’s credibility about where she is at any given time is suspect at best.